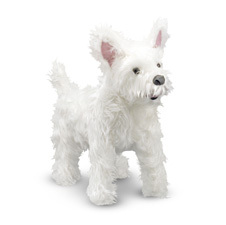 A soft lifelike stuffed plush West Highland Terrier created in the Bocchetta family tradition. Soft plush sitting Westie stuffed animal from Fiesta with a non-detachable red ribbon collar. Handcrafted European style lifelike stuffed plush West Highland Terrier Puppy from Hansa. If long eyebrows and whiskers don't charm you, the long, snuggly body of this Westie should do it! Made of soft, fuzzy fabric, with contrasting textures, this puppy is happy to perch on your shoulders or in your lap. Age rating: 2 yrs and up. With its snowy white fur and pointy, upturned ears, this perky little Westie is a perfect companion. It is just the right size to nestle in your lap or tuck under your arm for snuggling. Excellent quality construction and bright, friendly eyes ensure that this pup will be a longtime companion. Dimensions (W x H x D): 18 x 16 x 7. Age rating: 3 yrs and up. With its snowy white fur and pointy, upturned ears, this perky little Westie is a perfect companion. It is just the right size to nestle in your lap or tuck under your arm for snuggling. Excellent quality construction and bright, friendly eyes ensure that this pup will be a longtime companion. Each West Highland Terrier Plush animal measures approximately 9.5 inches. Hot pink leopard print purse with the divine removable West Highland Terrier Plush Stuffed Animal perfectly perched inside. Find Plush Westie Terriers for bid at Ebay.